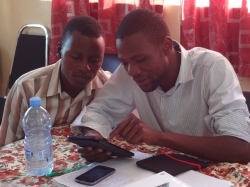 Students in Kilosa, Tanzania, try out the new tablet app. 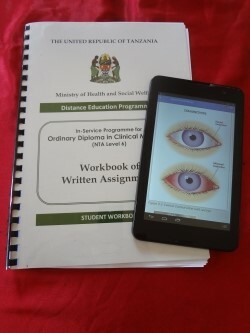 In November 2014, the Tanzania Ministry of Health and Social Welfare (MOHSW) launched a program that allows practicing Clinical Assistants to upgrade to the level of Clinical Officer — the first MOHSW distance learning program in Tanzania to use tablet computers to deliver medical course material. The International Training and Education Center for Health (I-TECH) and the University of Washington Department of Global Health’s e-learning group (eDGH) collaborated with the MOHSW on the In-Service Programme for Ordinary Diploma in Clinical Medicine, a blended distance learning program. Credential upgrades expand the range of health care services that these practitioners can provide, including care and treatment of HIV and AIDS. They are also expected to have a positive impact on retention of healthcare workers. The use of tablet technology makes these upgrades more convenient and accessible. Support for this project was provided through the U.S. President’s Emergency Fund for AIDS Relief (PEPFAR) by the U.S. Department of Health and Human Services’ Health Resources and Services Administration (HRSA). Programmatic oversight was provided by the U.S. Centers for Disease Control and Prevention (CDC) in Tanzania. Sixty-five students have enrolled in the inaugural cohort. I-TECH has worked with the MOHSW since 2010 to redesign the Clinical Officer upgrading program to align with current clinical guidelines and competency-based training approaches. Sixty-five students, based at health facilities throughout the country, have enrolled in the inaugural cohort, at three Clinical Officer Training Centers based in Kilosa, Mafinga, and Mtwara. Scale-up to additional training centers is planned for next year. The new two-year Clinical Officer upgrading program incorporates three modalities: self-paced learning using interactive e-learning materials on tablet computers, face-to-face classroom activities and instruction, and hands-on practical training in clinical settings. Upon completion of all course requirements, students will earn a Diploma in Clinical Medicine after achieving a passing mark on the National Qualifying Examination. Learning materials for the In-Service Programme for Ordinary Diploma in Clinical Medicine. I-TECH and eDGH instructional designers and e-learning specialists collaborated with the MOHSW to design a digital textbook application for the Android platform. Students will complete e-learning modules using this app during self-study periods. The app is designed to enhance self-directed learning by embedding interactive quizzes, anatomy tutorials, and other learning exercises into the course text. It also includes full-color photos and videos that are not available in the traditional residential training program. MOHSW and training center representatives designed the course schedule and clinical rotation plan, provided clinical review, app testing, and assisted in the design of learning exercises. In preparation for the official launch, I-TECH officially handed over all teaching and learning materials, including a donation of 73 tablet computers, to the Human Resource Development Department of the MOHSW. Tablets were distributed to students and faculty at each participating training institution. I-TECH and the MOHSW conducted a faculty orientation to prepare principals and instructors at each training institution to successfully facilitate a distance learning program. In turn, training center faculty conducted student orientations at each site during the first face-to-face session. In the coming weeks, the MOHSW and I-TECH will orient distance education mentors based near students’ homes, who will support students during practical rotations. I-TECH will evaluate the first year of course implementation, and results will inform future scale-up and transition planning with the MOHSW to help ensure a sustainable program. To further support sustainability, the MOHSW has established a revolving fund to purchase tablets for future student cohorts.